Experience craftsmanship and privacy when you purchase classic plantation shutters in long-lasting materials and finishes from Closet Works. These custom shutters keep the look timeless but still have all the benefits of advanced, modern-day materials and long-lasting finishes. 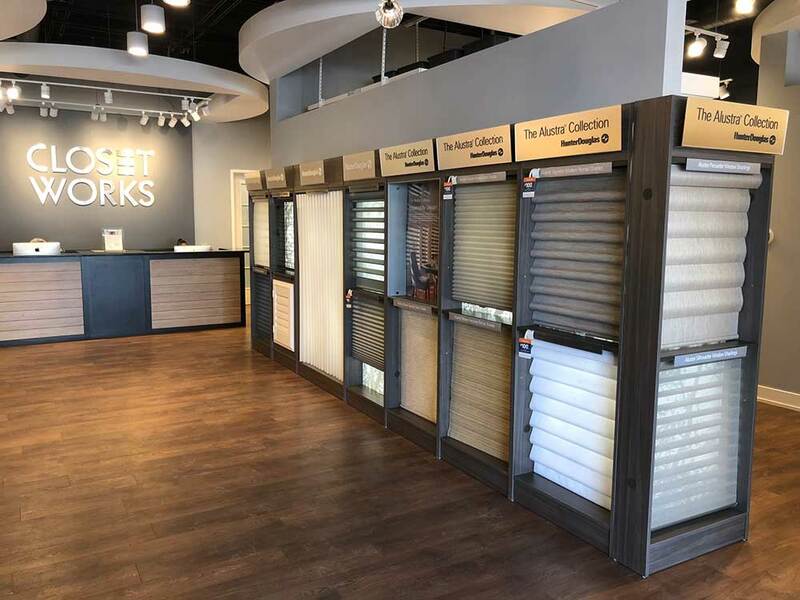 Closet Works carries the complete line of Hunter Douglas shutters including Heritance® Hardwood Shutters, NewStyle® Hybrid Shutters and Palm Beach™ Polysatin™ Shutters. Hunter Douglas shutters offer the perfect compliment to your Closet Works organization system. Opting for one of these high quality window treatments creates a timeless and classic look within the home, ensuring that your purchase remains a wise investment for years to come. The simple elegance of rich, hardwood shutters gives a lift to any room. 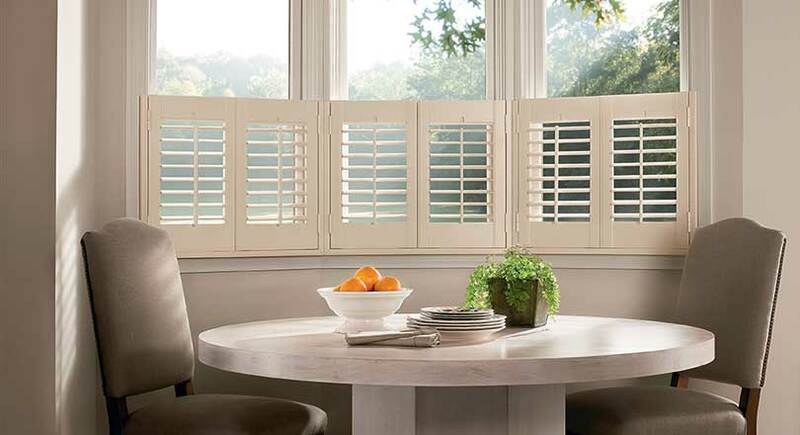 Built for long-term performance, Heritance® Hardwood Shutters are plantation-style shutters crafted from genuine hardwood. They feature dovetail construction for maximum strength and a vast selection of frame choices, louver sizes — plus a variety of paint and stain finishes and custom colors. In addition, a diverse range of specialty shapes with sunburst or horizontal louvers are available to create the ultimate custom shutter for your home. Available operating systems for Heritance® include: Bi-Fold Track; Bipass Track; Hinged Panels; Front Tilt Bar; TruView™ Rear Tilt. Louvers: 2-1/2", 3-1/2" or 4-1/2"
Heritance® is available in either painted or stained finishes. The fifteen standard painted colors include: Silk White, Avalanche, Classic White, Sheer White, Snow, Perfect White, Cloud White, Picket Fence, Designer White, Sand Dollar, Sugar Pine, Sea Shell, Oyster, Fall Rustle and Malted Milk. The twenty one standard stained colors include: Wheat, Pickle, Driftwood, Maple Honey, Fruitwood, Salt and Pepper, Goldenrod, Copper River, Pecan, Pewter, Auburn, Rich Leather, Mission Oak, Dark Oak, Velvet Rope, Windsor Walnut, Dark Chocolate, Charcoal Sketch, Red Mahogany, Midnight and Espresso. Custom colors are also available. See your designer for color samples. Hunter Douglas NewStyle® offer the best of natural and new, with the look of wood and the strength of modern-day materials. A versatile complement to any interior, their micro-smooth finish makes the beauty of high-quality shutters affordable for any home. Available operating systems for NewStyle® include: Bi-Fold Track, Bipass Track, Hinged Panels, Front Tilt Bar, TruView™ Rear Tilt. Available in five solid colors and four Ultragrain™ wood look finishes. Solid colors include: Crisp White, Swiss Cream, True White, Parchment and White Lace. Ultragrain™ includes: Toasted Honey, Warm Amber, English Saddle and Urban Grey. See your designer for color samples. Available operating systems for Palm Beach™ include: Bi-Fold Track, Bipass Track, Hinged Panels, Lantana™; Front Tilt Bar, TruView™ Rear Tilt, and now PowerView®. Available in three colors including Bright White Polysatin, White Polysatin and White Silk Polysatin. See your designer for color samples. Hunter Douglas Shutters from Closet Works are available with several operating systems. Operating systems for Hunter Douglas Shutters include Bi-Fold Track, Bipass Track, Hinged Panels, Lantana™; Front Tilt Bar, TruView™ Rear Tilt, and PowerView® (PowerView is available on Palm Beach shutters only). Available systems will vary by style of shutter. The operating system choices for your window treatments will depend on the particular shutter you choose.